Are you ready for another day of My Creative Time sneak peeks? There are two new sets being showcased today, and I'm sneaking the new Way to Go set! 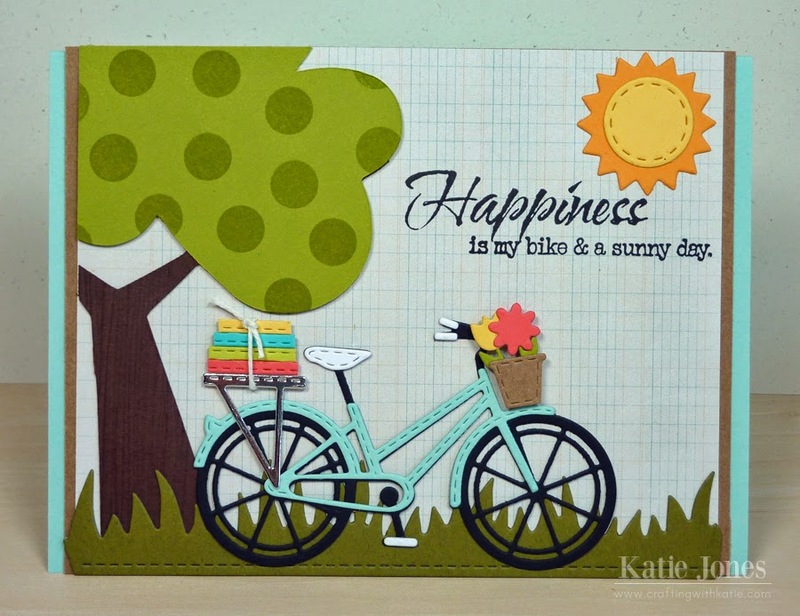 You will just love this set: an adorable bike with so many fun layers, plus lots of coordinating sentiments! For my card today I created a scene using a tree from the Cricut Just Because Cards cartridge, cut at 12.3". I stamped the foliage with the soccer ball from the MCT Soccer stamp set and embossed the trunk with Papertrey Ink's Woodgrain Impression Plate. The grass was made with MCT's Stitched Grass Die. Isn't this bike from Way to Go just the cutest thing ever??? I decided to put flowers in the basket, but there are dies for other options as well. To make the books on the bike rack, I cut the bike rack out of four colors and then just trimmed off the bottom part and cut off the edges to make various "sizes" of books. The sentiment is made up of two stamps from the set. There are lots of mix and match options. I made the sun with the MCT Build a Banner Kit. 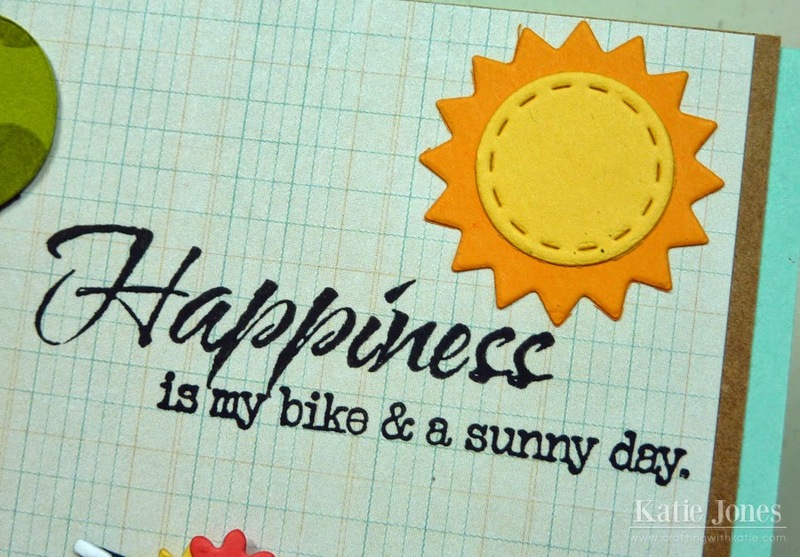 OMG Katie your card put the biggest smile on my face your bike is so cute love the color of it and then your basket of posies and your cute idea for the books blew me away how clever of you!!!! Gosh and the sentiment is so precious as my hubby and I love to bike ride so this really touched my heart and he's a huge reader.....love..love!! Can't wait to get it all!!! Katie - I love everything you create! I love how you put the books on the back tied down and the flower basket on the front. Great job! Ooh Katie, your card is adorable! The scene is incredible! I lOVE the bicycle and the fun little flowers basket. Awesome card!!! Hello Katie, love the card. Very cute, great idea with the books. What a perfect card to remind someone of a fun summer day! Love all of the wonderful details you put into it! Wow Katie, I am so loving your card! I love how creative you ladies are in using Miss Emma's products. I love that you took the bike rack and made books from it-very clever indeed! lol I saw it before I came to your blog and thought, "oh I love those books". lol Love the sentiment and love that the sentiments can be mixed and matched! This is such a great release so far, but then again aren't they all from Miss Emma?! I LOVED this from the moment I saw it!!!!! Just GENIUS on how you made the books on your rack on the back of your bike!!!! LOVE LOVE LOVE! Oh my goodness!!! Those books were such a fabulous idea!! Such a pretty card!! Really!! You have done a FABULOUS job of showcasing this set. LOVE, LOVE this card. That bicycle die set is OUTTA SIGHT!! How you did the stack of books by altering the bike rack...AWESOME!! And, you used different MCT old and new products...WAY TO GO!! SUPER JOB!! Great Card Katie. This bike die is going to be a hit for sure. Katie ~ OH MY word! This is seriously BEAUTIFUL! I LVOE the whole scene from the tree, to the grass to all the details on that bike! Okay the books ~ BRILLIANT idea!! EEK! Then tying them up ~ I LOVE it!! Of course I LOVE the papers the grid paper is so AWESOME!!! Your card really depicts the sentiment. Love it. the books an the tree ...way cool ideas!!! love it!!! Katie you had me at the Aqua bike! Seriously, my favorite color! This is so stinkin' cute! Love the sentiment too! I am smitten! Wow, that is really adorable!! Love this new die. Way cute! 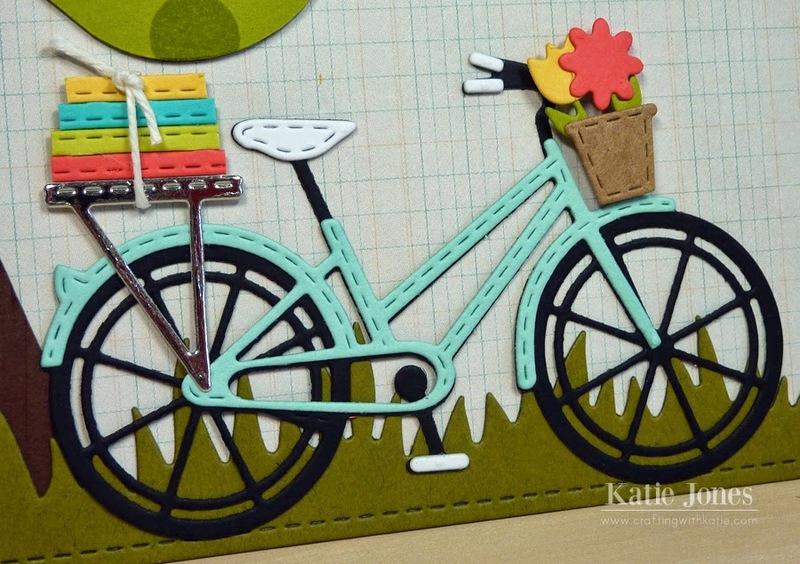 I love the scene you created on your card, and the stitched details of the bike are so fun. This is super adorable Katie!! I love the scene you created and the books...so clever!!! Great card. Love the books on the back rack. Lots of interest with the tree and the sun. Remember the aqua bike. Super duper cute, Katie. I love all the detail of the scene you created. What an awesome idea to create your book stack and your basket with the flowers is the perfect finishing touch for the bike. Such a happy and pretty card. Love stack of books! So cute and I love how you stacked the books on the back. Very creative. I am loving the bicycle. The basket on the front and the darling stack of books make this card awesome! Super cute card! Love the books on the bike ~ clever! OMG Katie, your card is beautiful, thanks for sharing, you did a great job! You made a fun scene to put the bike in. I love the books on the back. This is absolutely adorable, Katie! And you're so creative ~ love how you've created the books!! Thanks so much for the chance to win today! Oh my GOODNESS! Your card is just too darn cute! Katie, love the way you decorated the bicycle. The books are so cute on the back. Day one and two have been WOW!!! but I am even ready for another...I can't imagine what else Emma came up with...I can't wait to play with this release. Your scene is so cute! Wood grain on the tree, the grass and so clever to make books and the sun. Fabulous job! I LOVE all your sweet details. The books, the flowers. CUTE. I'm loving the bike too! Ingenious creation of the book pile on the back--too cute! Your card is way too cute!! Very cute--love the stack of books. Love, love, love the books! Very ingenious! Katie.....LOVE LOVE your card...it is just so cute, colorful full of summer and spring color and cheer. Also great sentiment! Just adore your card Katie! That bike is just the cutest and the love colors. Lovely card Katie! Amazing attention to detail! LOVE it! You did a wonderful job with all the amazing and oh so cute die cuts. Great job on the bike! MCT 31st Edition Release Blog Hop!